Are you looking for freezer friendly meals? I get asked about freezer meals all the time and for good reason! We don't always have the time to cook every night, but sometimes we may have an evening or two a week to prep for future meals. Although we may have busy schedules, we still want a delicious home cooked meal! 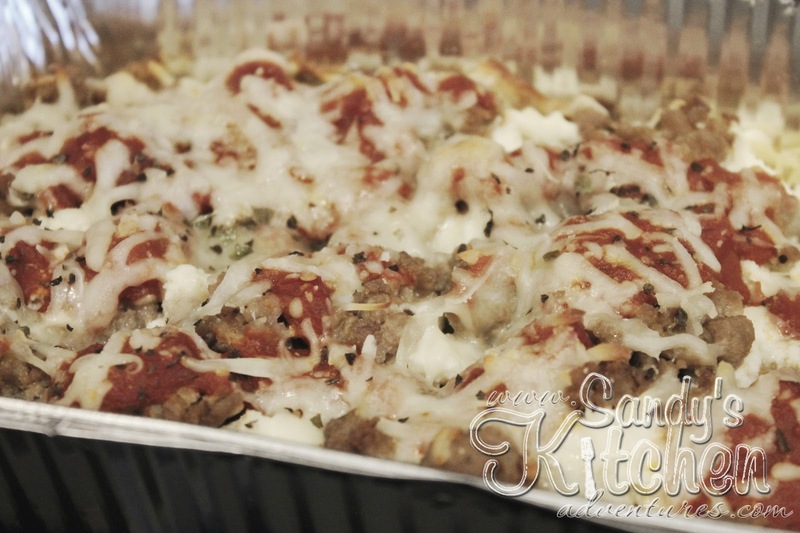 Lasagna has always been a great choice when wanting a meal that freezes well! Instead of the traditional carb-laden lasagna, I made lasagna using spaghetti squash. Spaghetti squash doesn't taste like pasta, but it does have a mild flavor which tastes wonderful with marinara sauce. This recipe still has all the flavors of a hearty lasagna, but it is also light and healthy because the pasta is a veggie! This a dish your entire family can enjoy! 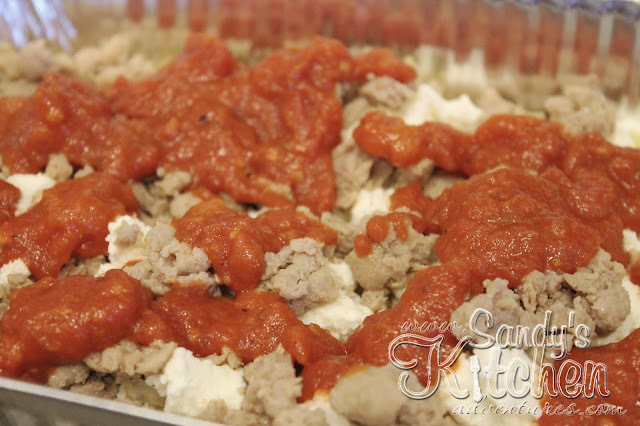 Roasted spaghetti squash, creamy ricotta cheese, sweet Italian turkey sausage, marinara sauce and mozzarella cheese! Comfort food to the max! 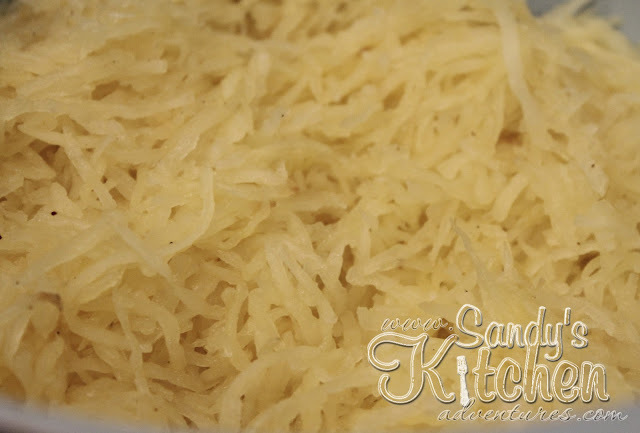 Spaghetti squash does have a tendency to release water when cooking. This is natural! I do find it to be less watery when I roast the squash in the oven rather cooking it in the microwave. Oven roasting is now my preferred method of choice. I think roasting makes all veggies taste better! 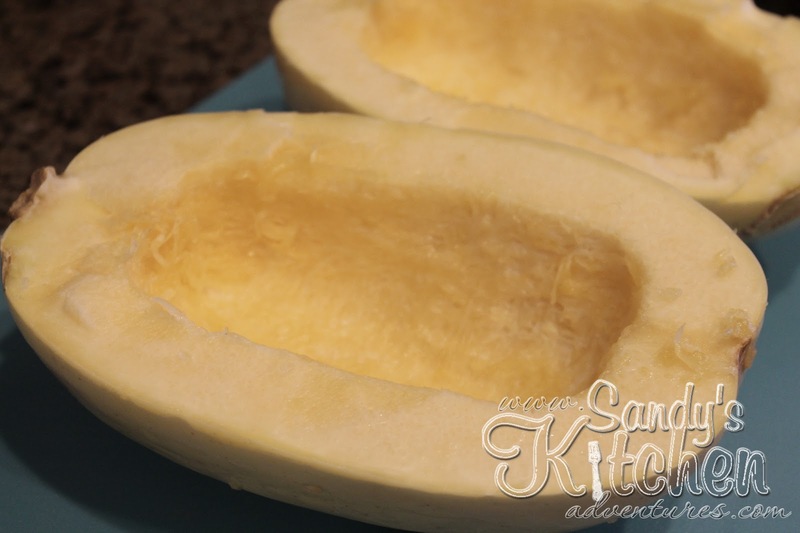 Begin by cutting the spaghetti squash in half lengthwise and then scooping out all the seeds with a spoon. Get all those loose goopy (is that a word?) strands that are mixed in with the seeds too! I sprayed the squash with olive oil cooking spray and seasoned it with salt and pepper. Place the squash cut side down and bake until tender. I love how the squash gets nice and brown around the top edges. Use a fork along the flesh to make long spaghetti-like strands in a bowl. 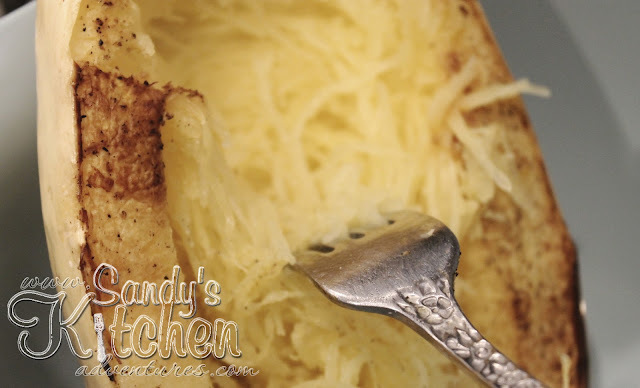 Delicious spaghetti squash strands! Ready to use or be eaten! Measure out 1 cup of spaghetti squash and place on the bottom of a container. Sprinkle basil and garlic powder on top. Then add ricotta cheese. I used foil containers because I was freezing additional future meals. 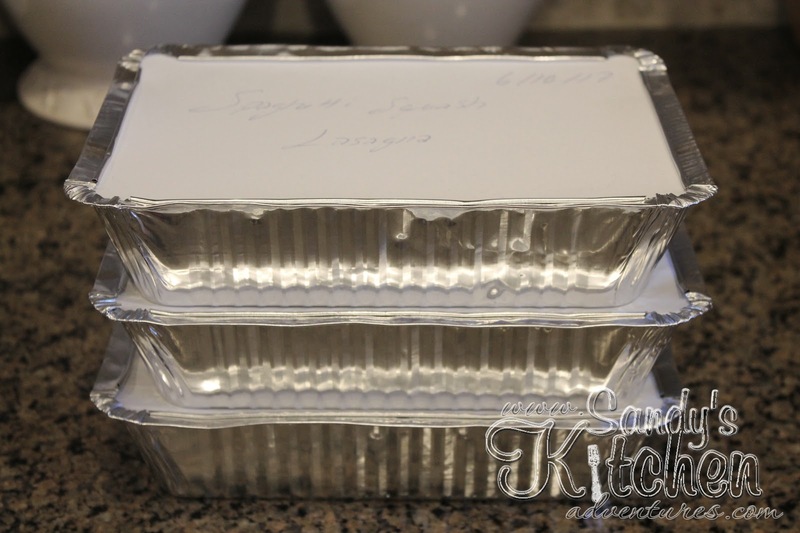 These foil containers are great because they can go from the freezer to the oven without cracking or breaking, unlike glass containers. I got these containers from Amazon. Click HERE for the link! 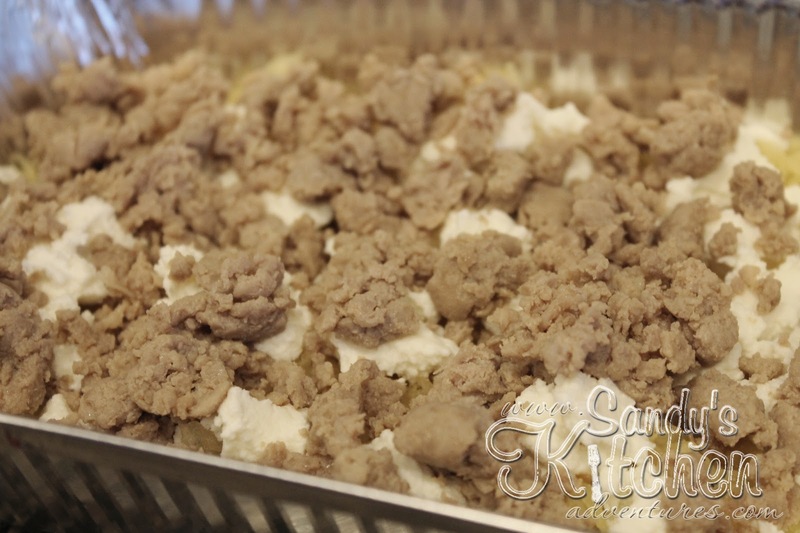 Next, remove the sweet Italian turkey sausage from their casings and cook until the sausage is cooked thoroughly. Drain the fat and set aside. 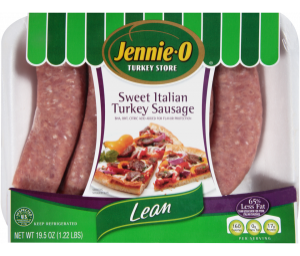 Here is a pic of the turkey sausages in their package. This sausage tastes amazing and is perfect for spaghetti or lasagna! Measure out 3 ounces of sausage and spread it over the ricotta cheese. 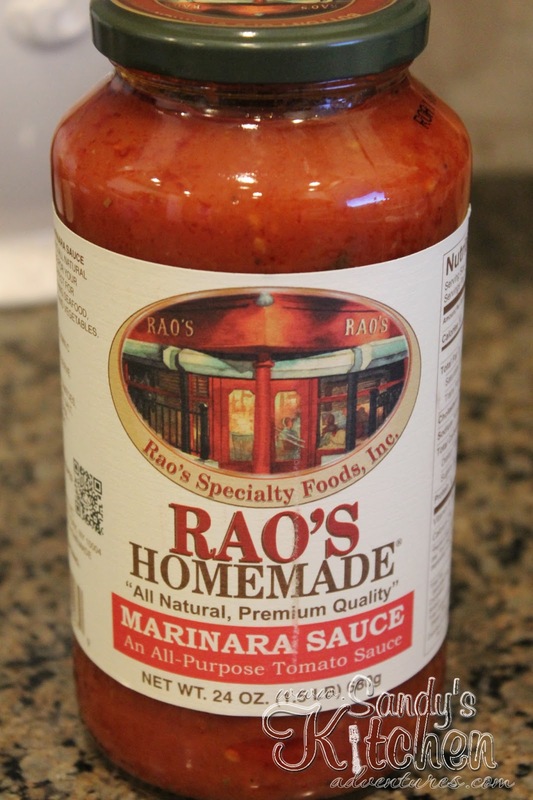 Add Rao's marinara sauce next. This is the sauce you need to try! 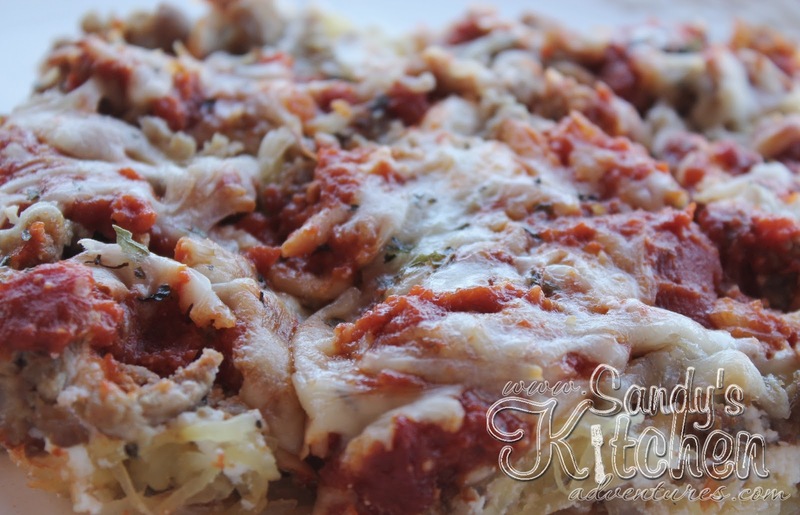 It tastes so delicious and it is lower in carbs than most marinara sauces out there! It is only 2 grams of carbs for 1/4 cup! That's it! 1/4 cup is considered 1 Green on the Medifast Plan. I will admit, it is quite pricey at almost $9 a jar! Take into account, I will only use 1/4 cup servings at a time so it will last me a little while. You can get this sauce at Target, Wal-mart or Sam's Club. I am sure there might be other locations where you can find them so look around! 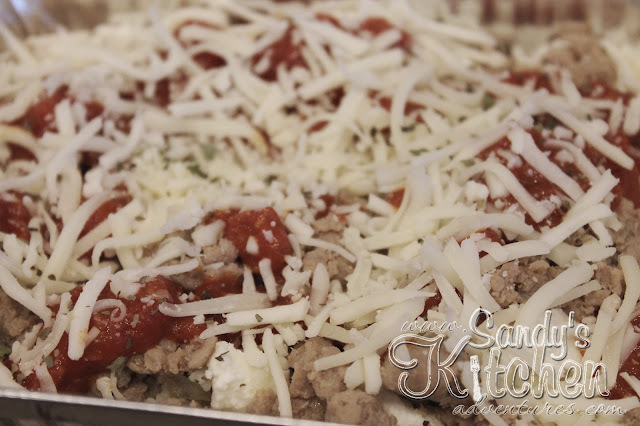 Sprinkle mozzarella cheese and parmesan cheese on top. Bake for about 30 minutes or until heated thoroughly and cheese has melted. I got 4 servings from my spaghetti squash and sausage, Three of these meals are going in the freezer and the other one is getting in my belly! You can write directly on the lids of the foil containers. 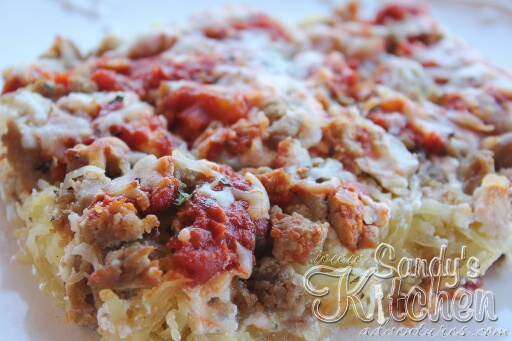 Write "Spaghetti Squash Lasagna" and the date. You could also write the re-heating instructions too! Yummy, hearty, comfort food I can prep ahead of time! Enjoy! 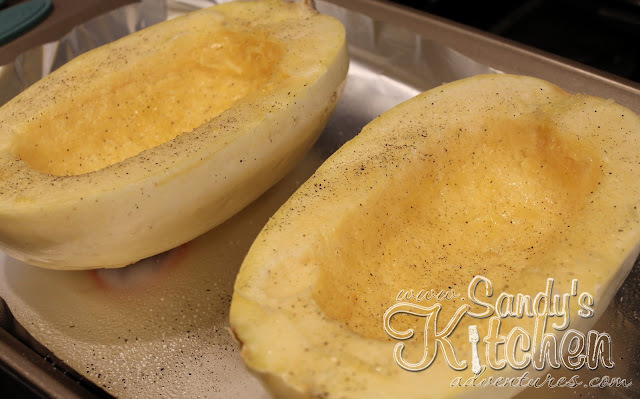 Cut spaghetti squash in half lengthwise and scrape out the seeds with a spoon. 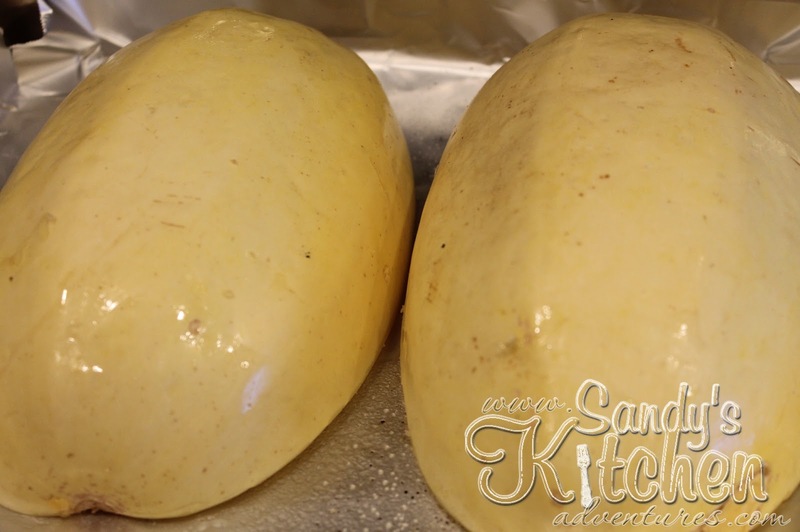 Place spaghetti squash on a baking sheet and spray with olive oil cooking spray. Season lightly with salt and pepper, if desired. Place the spaghetti squash cut side down on the baking sheet. Bake for about 45 minutes or until squash is tender. Using a fork, scrape the flesh to get spaghetti-like strands. 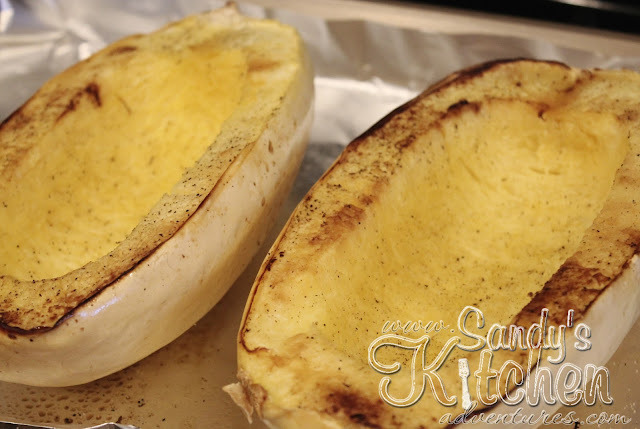 Measure out 1 cup of spaghetti squash and place on the bottom of an oven-safe container. I used foil containers because I wanted to make extra to freeze for future meals. 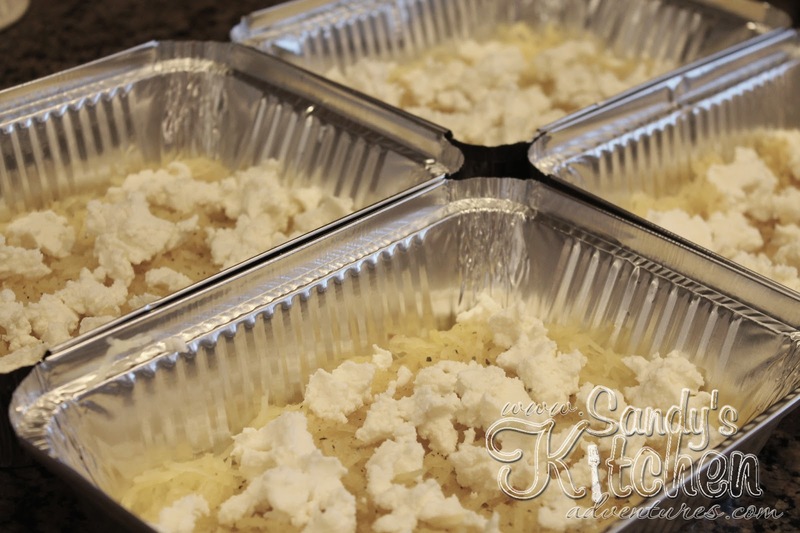 The foil containers are great to use from freezer to oven. Sprinkle garlic powder and dried basil on top of spaghetti squash. Then drop small spoonfuls of the ricotta on top. Remove the Italian sweet sausage from their casings. Place the sausage in a medium sized skillet and cook over medium-high heat until cooked thoroughly. Drain the fat from the sausage. 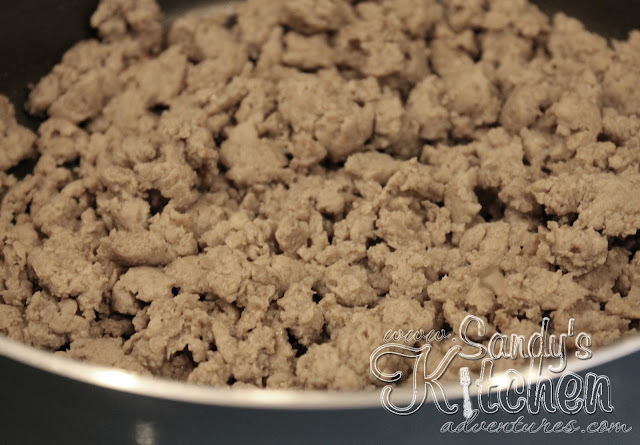 Measure out 3 ounces of cooked sausage using a food scale. Sprinkle the sausage on top of the ricotta cheese. Then add Rao's marinara sauce on top of the sausage. Next, add mozzarella cheese and parmesan cheese. At this point, you can freeze the containers or you can bake them. If you freeze them, place it in the fridge the night before you plan to eat them. Bake at 350 degrees for about 35 to 40 minutes or until heated thoroughly. If you wish to bake now, bake at 350 degrees for about 30 to 35 minutes or until heated thoroughly.